Photo: Tony Lippett's 25-yard Rose Bowl TD. Below in order, Trae Waynes, Jeremy Langford, Lippett, Keith Mumphery. When NFL teams are in the final stages of preparing for the draft, they set aside a day or two when the general manager, player personnel executives, the coaching staff and scouts gather in a conference room. They read through the reports they’ve compiled on players eligible for the draft. They are fixated on athletes they expect to be available to fill a need as well as those to turn to if their target is not available. Jimmy Raye has been in many such rooms throughout his career as an assistant coach and offensive coordinator. Michigan State's pioneer black quarterback and ground-breaking college and NFL coach is now an NFL Senior Advisor entering his 39th season in the league. With Michigan State cornerback Trae Waynes among four overall Spartans draft picks, I asked him to provide a look at how teams viewed Michigan State’s prospects during “The Reading” and on draft day. Raye comments on Waynes being on every team's draft board, Jeremy Langford and Keith Mumphery as good fits for their respective teams and Tony Lippett as a steal for the Dolphins as a candidate to play both ways. He expected New England to take him for his versatility. 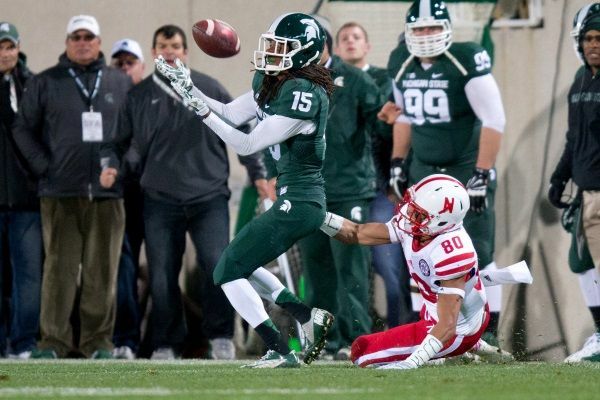 Trae Waynes, CB, 6-0, 186, first round, 11th pick overall, Minnesota Vikings. Raye’s take: “I had heard about him the year before when Darqueze Dennard was drafted in the first round by Cincinnati, and people in the league said Michigan State had another good corner. I also saw him last season at the Lansing Downtown Coaches Luncheon the week of the Wyoming game. “I think what Michigan State has going for it in secondary play is they do a great job of teaching press coverage and bump and run. He’s a top player with size, skills, strength and he can run. With the system Michigan State played, he had to be a top priority on everybody’s draft board. Minnesota head coach Mike Zimmer is a defensive-minded coach, and if you have to defend Chicago, Green Bay and Detroit in your division, a cornerback is a top priority. Jeremy Langford, RB, 6-0, 208, fourth round, 106th overall, Chicago Bears. Raye’s take: “I know running back is a position that has become a secondary thought in the NFL, but I like him. I don’t like him as much as Le’Veon Bell (2013 second-rounder taken by Pittsburgh), but he has a similar skill set. Michigan State is a physical running team and he is an excellent addition for a team like Chicago. They have a similar back in Matt Forte. 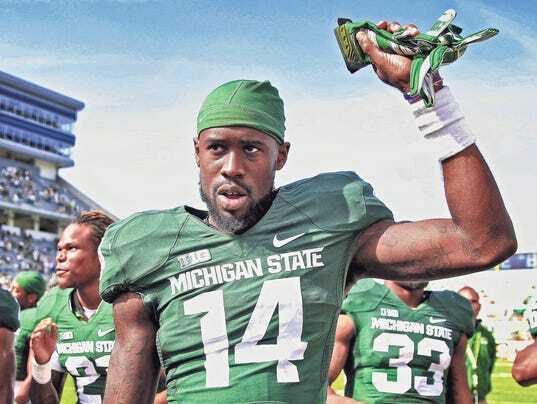 Tony Lippett, WR/CB, 6-2, 192, fifth round, 156th overall, Miami Dolphins. Raye’s take: “I think he was the steal of their draft in the fifth round. He is one of the few guys that could play both ways in the NFL. It wouldn’t surprise me if they used him in nickel packages on defense early in the year and then use him on offense when they go to three- and four-wide receivers. He was a great pick in the fifth round. “I think he would have been an ideal player for Bill Belichick to have taken earlier at New England with the success he has had with two-way players. He might have dropped to the fifth round because people weren’t sure where to project his future, but I don’t see a difficult transition to defense for him. Keith Mumphery, WR, 6-0, 215, fifth round, 175th overall, Houston Texans. “Over the past three years, Michigan State has won 31 games, so it’s a program with guys that are capable of being drafted or signed as free agents. With the quality of play at Michigan State and the level of competition, their free agents have an excellent chance of making a team. The program fosters the fact an NFL team is getting a good, quality player.